Klein Tools invited me to come visit their manufacturing headquarters in Mansfield, Texas for a behind the scenes tour of the facilities and to meet some of the people that put the world’s best hand tools in our tool belts. As I packed to leave and thought through what I wanted to learn, I figured this trip was going to be a lot about tools. Don’t get me wrong, I did learn a lot about the process of taking a 20 foot long steel rod and turning it into a set of Klein All-Purpose Pliers. I also learned about a man named Mathias and about the cost of commitment. Let me take you back to 1850’s Chicago and a blacksmith’s shop where a German immigrant named Mathias is hammering away on a piece of steel. We’re not really sure what he’s making; it’s not taken form yet. A man comes in the door with a pair of broken pliers and asks Mathias if it would be possible to fix them. Mathias takes an appraising look, decides that he can forge a new piece for it, and does so. At a time when people fix what they can rather than simply replace it, the man leaves a happy customer. Not much time passes before he returns. The other side has broken now. Mathias forges the opposite side of what he created earlier and the first set of Klein Pliers has been created. The worker was so thrilled with the quality of Mathias Klein’s work that he told others of this blacksmith creating a demand for these high quality pliers. There at a blacksmith’s shop in 1857 Chicago, Klein Tools was born. Most of us are aware of Klein’s reputation for quality. It’s no accident that Mathias’ insistence on taking the time to make the highest quality tools still resonates through the company today. Klein Tools is still owned and managed by the Klein family. The drama of the publicly traded company’s board room doesn’t exist here. Where most family businesses only survive to maybe the 3rd generation before being acquired, going under, or sold, Klein now has its 5th and 6th generations of family members on board, with the 7th generation on the way. What keeps the business in the family? It’s no secret. They do what all good parents do – they teach their children. They teach them about the benefits of creating a quality product and what a career with Klein Tools can do for them. The kids are certainly welcome to make their own decision and walk a different path (and some do), but time and time again, they choose to continue the legacy of Mathias Klein. Klein has always been, and remains, committed to manufacturing their hand tools in the USA. Despite rumors of moving to China, closing plants, or outsourcing jobs elsewhere, they are investing in that “Made in the USA” standard and keeping Americans employed. Sure, they have some plants in Mexico, Brazil, and Australia. Part of that is logistics – growing an international business in an efficient manner. There are simply some parts of the manufacturing process that can’t be done here because of the availability of materials. The fact is that those are not outsourced jobs that replaced Americans; it’s expansion. I had the chance to chat with John McDevitt, Executive Vice President of Sales and Marketing, about Klein’s international operations and its employees. In terms of that international expansion, there is a global demand for their products. The result of that demand is that the number of tools produced in America and sold internationally is far greater than what is imported from their foreign plants. Vice President of Marketing, Greg Palese also added that Klein produces 14x more products in the USA than any other country they operate in. Here’s the kicker for me though: the USA is at a massive trade imbalance (we spend more on imported goods than we sell to other countries), yet Klein brings in more money from their international sales than they send out to support the foreign portion of the manufacturing process. They’re one of the few companies that is helping our trade balance instead of hurting it and the difference is in terms of dollars is incredible. If you’re an employer, then you know that hiring and training employees is expensive. Klein knows that by offering competitive pay and a solid benefits package, they can attract and keep some of the best workers in the industry under their roof. Employees are able to take advantage of health insurance, paid vacation time, a matching 401(k) plan, and higher education help in addition to the profit sharing that each employee automatically gets. The smile that we got from Deborah Jones here is representative of the morale of the employees we saw while touring the facilities. Klein invests a lot more capital by keeping their operations here and employing so many Americans than they would if they outsourced or simply moved its base of operations outside the US. Yet by doing so, they keep Mathias’ legacy alive and keep the production line vertical. From selecting the steel that is mined here in the US through every step of manufacturing and distribution, Klein has control of each part of the process. Every tool is in the hands of an employee for inspection before it can be packed and shipped off to its final destination. This vertical integration and capital investment means that every tool meets Klein’s expectation that they are producing the highest quality hand tools in the world. So yes, Klein puts incredible quality in their tools and is always looking for innovative ways to make our jobs easier. But Klein Tools is so much more than a tool company – they’re the American dreamers and idealists that still believe the highest quality is the only quality and that loyalty to the country that accepted a German immigrant over 150 years ago is simply part of who they are. 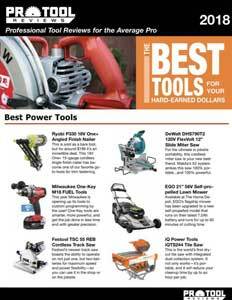 We were given a demonstration by Milwaukee and Hilti, head and shoulders above all other when it comes to power tools. We also witnessed a demonstration from Diablo blades and their new line of carbon embedded blades, they will do a demo of cutting a cast iron pipe like butter, stainless steel pipe and steel nails. Unbelievable. What are Klein Tools new tool line like ? What was the outcome of your Klein Pliers review ? I had a few misconceptions about why Klein Tools moved manufacturing overseas, then imported their products back to the US. This is a good read. Thanks for sharing.